One of the most famous mosses, probably because of the distinct color of its flowers. Named after the English poet Edward Young (1683-1765) and his poem “Night Thoughts” by the Anglophile Laffay. ‘Nuits d’Young’ forms a wiry, thin bush up to 1.20 meters with small, pointed, dark green leaves. 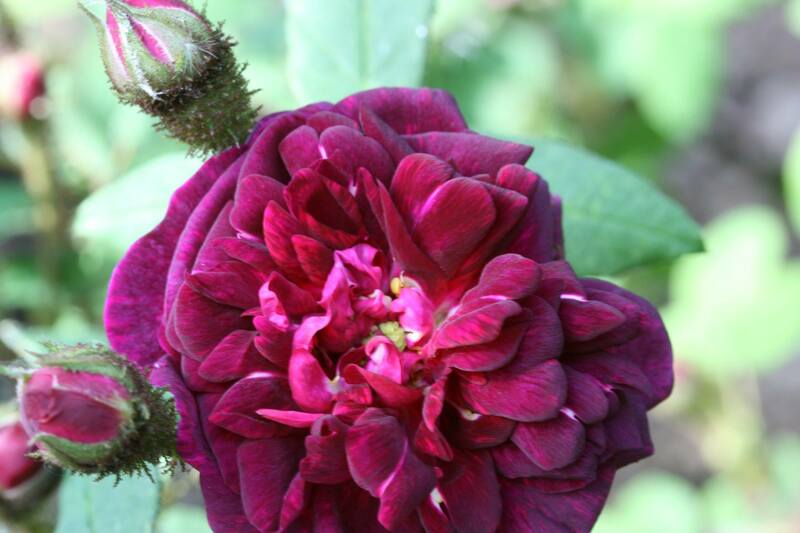 The medium sized flowers are of a very dark, velvety maroon-purple, which –unlike most dark colored roses- keep their color extremely well in full sun. With its rather small flowers, it has the aspect of a mossy Gallica, and, like the Gallicas, it suckers freely when grown on its own roots or is planted deeply. Sadly very susceptible for mildew and blackspot. And truest friends, through error, wound our rest. And what hostilities, without a foe! Nor are foes wanting to the best on earth. And sighs might sooner fail, than cause to sigh.